NCEA IFG (Information for Growth) offers tools designed to assess the effectiveness of school and parish religious education programs over time. 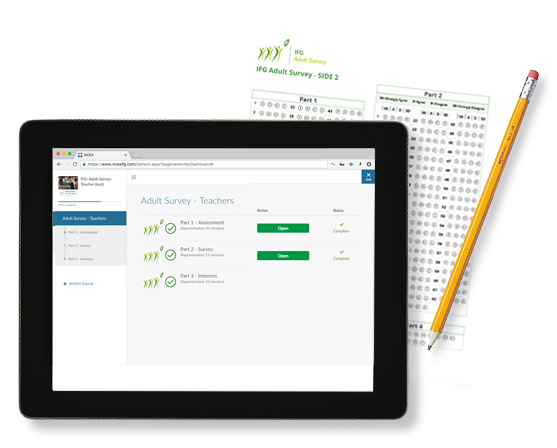 Offering both a student and an adult survey, IFG allows for data-driven decisions regarding student catechesis and adult faith formation. This religious education program tool is designed to assess and identify the on-going formation needs of adults. Helping Catholic schools and parishes assess how well their religious education programs are forming committed Christian disciples. here are a few of the reasons they prefer the online format. Assessments can be accessed any time, any place, and from any device. Virtually thousands of users can participate simultaneously. Users and administrators appreciate the rapid feedback provided through online reporting. This reporting tracks progress and identifies strengths, or weaknesses. Save money by not printing paper assessments. Save even more by making quick updates and changes online; no outdated print materials. Yes, when you check our you can pay by credit card or Purchase Order. If you choose PO, an invoice will be sent to you with instructions for payment. Can I use my existing answer sheets? No, this year we have new answer sheets that are unique to each level. You can get credit for existing answer sheets (Credit instructions). You can use the existing Test Booklets for each level. Are my test books still current? The current edition for the test booklets is the 2013 edition. Level 1 - Form 13, Level 2 – Form 23, Level 3 – Form 33. Do I need a header sheet? The old header sheet is not needed any longer, but please be sure to include the new cover sheet with your answer sheets. Where do I send my finished Answer Sheets? You can email us at help@nceaifg.com any time and we would be happy to help. You can also call us at: 1-800-707-NCEA (1-800-707-6232). We provide a signup page that quickly gives access to the online assessments for students and adults. Click the appropriate button to start taking your survey. If you are taking the Adult Survey and you are logging back in to finish, click the blue LOGIN button at the top of the site. My Catholic Faith Technologies has partnered with NCEA to provide the Information for Growth assessments for the Adult Survey and ACRE programs. We provide online and paper/pencil assessment options and detailed reports when the process is finished. The Information for Growth (IFG) survey is designed to assist individuals in assessing their personal level of religious knowledge and spirituality. It also provides parishes, schools, diocesan offices, and adult faith formation program leaders with group data to use in planning ongoing faith formation initiatives. The 2006 Revised IFG bases its blueprint on the Six Dimensions of Adult Faith Formation Content as outlined in the U.S. Bishops' document, Our Hearts Were Burning Within Us: A Pastoral Plan for Adult Faith Formation in the United States. ACRE is designed to assist in the evaluation of catechetical/religious education programs in Catholic schools and parishes. As a multilevel, age appropriate tool, NCEA ACRE is used in grade 5 (Level 1); grades 8 or 9 (Level 2); and grades 11 or 12 (Level 3). The NCEA IFG: ACRE edition is based on the Catholic Church’s expectations for an organic, systematic, and comprehensive education in Christian discipleship. Currently, it is the only tool that provides national scores for comparison and processes for tracking religious education program data over time. To receive credit for existing answer sheets follow these instructions carefully: If you have ordered ACRE/IFG answer sheets in the past/have any left over from last year, please note that the old answer sheets are no longer compatible with the new ACRE/IFG scoring format. NCEA will accept any old ACRE/IFG answer sheets for a refund up to the amount that have been ordered from NCEA’s new partner My Catholic Faith Technologies. We will refund them at $3 per answer sheet and a .20 cent premium over the purchase price to cover the shipping costs to return them. This offer is only valid until 6/30/2019. * Be sure to download the Credit Cover Sheet (PDF) and include it when sending answer sheets to NCEA.